Valtteri Bottas is confident of racing in Malaysia at the end of the month after missing the first grand prix in Australia because of a back injury. The Finn, 25, was told he could not compete after suffering a small tear in an annular disc during qualifying. "Progress is made and every day is a step forward. 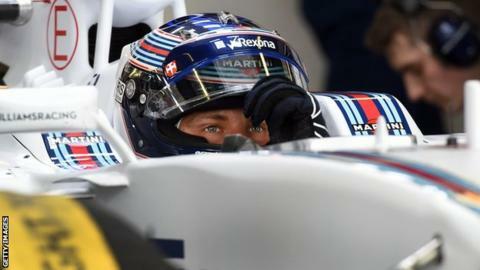 Can't wait for Malaysia," tweeted the Williams driver. Bottas qualified sixth in Melbourne but was not allowed to race by official Formula 1 medics. Despite complying with the requirement to get out of the car within five seconds, doctors said he had been in severe pain while doing so. They also felt he would not be able to get out of the car as quickly if his back had been bounced around during the race and were also concerned about him doing himself further damage. Williams have not said who would replace Bottas in the unlikely event that he cannot race in the Malaysia Grand Prix on 29 March. Mercedes reserve driver Pascal Wehrlein is considered the most likely choice. The German, 20, has experience of two modern F1 cars - the current Mercedes and last year's Force India - while Williams have strong ties with Mercedes, which supplies the team with engines. Williams have already ruled out test driver Susie Wolff replacing Bottas. Could McLaren struggle for years? Read more on McLaren: could one of F1's top teams struggle for years?